I was actually making this for my wife, because she is a sucker for anything having to do with garlic, but I over baked it a bit, and it ended up being my favorite and not hers (I love thick crunchy crust, she likes it thin with a soft crumb). More for me! All I did was use Jim Jahey's No Knead Bread recipe and I added some garlic cloves that I had roasted in the oven for an hour and a handful of chopped rosemary. Tasty, tasty, tasty. 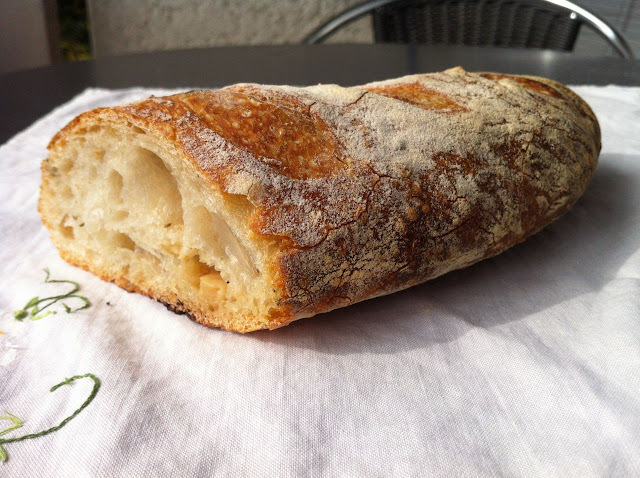 How did you achieve the baguette shape. I want that, but don't have the right size dutch oven or covered baking pan for that. Did you not use a dutch oven?